It used to be that you could take the family to the movies and not have to spend a lot of money. It seems as if those days are long gone. Regal Cinemas to the rescue! 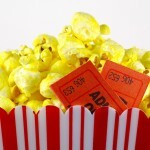 Every Tuesday the Regal Stadium 16 at Southland Mall has $5 movie tickets. That’s half price. All movies. All times. Not a bad deal on brand new movies. So if you’ve been meaning to catch a movie, wait until tomorrow and watch it there. The theater is brand new and state of the art, comfy seats, etc. Southland Mall is on US 1 and SW 205th Street. Turnpike to Exit 12, Caribbean Blvd. This entry was posted on Monday, March 22nd, 2010 at 1:44 pm	and is filed under 365 Things To Do In Miami. You can follow any responses to this entry through the RSS 2.0 feed. Both comments and pings are currently closed.